Tango Queer Barcelona. ¿Qué es? Video (3:24): PinkNews goes behind the scenes at the queer dance festival held in St. Petersburg, where it is illegal to be gay. This short film features Soledad Nani, Marina Ventarron and the queer tango social dancers in St. Petersburg. Video (12:38): A short film with clips from the 1st Queer Tango Marathon – May 8-10, 2018 in München, Germany, made by Pierantonio Romor. 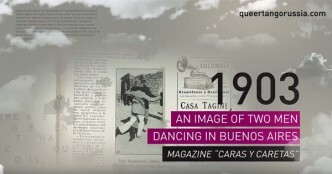 Video (3:39): This short news report about ‘Tango Queer’ in Mexico features an interview with Rodrigo Cervantes, organiser of Festival Internacional De Tango Queer De Mexico. Video (2:50): About Queer Tango Milonga – A Trailer about ‘Queer Tango Goes To Russia’, A creative documentary film by Alexandr M. Vinogradov. Video (1:40): promotional clip by Aleksandr M. Vinogradov, October 2017; a short clip showing an image of the queer tango in films through years. Video (2:58): Interview with Mariana Docampo, founder of the milonga Tango Queer in Buenos Aires. Video (6:05): Daniel Trenner and Rebecca Shulman, Exchg. of Lead Follow (Performance V107). 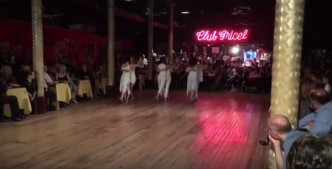 Video (6:12): Tango Con*Fusión performs ‘El Sol Sueno’ in Club Gricel for closing milonga of Johana Copes Lady’s Tango Festival in Buenos Aires, Argentina. 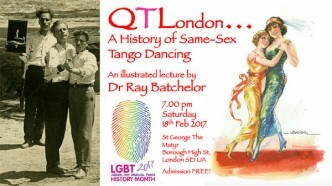 Video (46:38): As its contribution to LGBT History Month, Queer Tango London mounted this lecture by dr. Ray Batchelor on 18th February 2017. 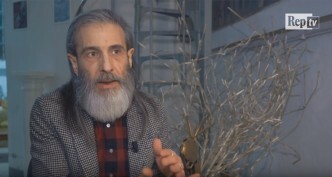 Video (4:05): filmmaker Aleksandr M. Vinogradov (Russia) says, I am happy to present a trailer for my new documentary “Queer tango goes to Russia”.